Quilting Adventures: On the hand work trail ...! I'm still plugging away at the Trick or Treat basket quilt by Blackbird Designs. As much as I enjoy machine appliqueing, it gets a bit monotonous to be doing the same thing over and over again, interspersed with thread changes to match the basket. Yawn! We are presently experiencing a weather surprise! Not sure how much we are expecting, but it "should" be all gone by tomorrow ... we are expecting rain! On another note, my left forearm is doing much better, so I can actually do some hand work! In between baskets, I'm working on the Beauty All Around BOM that I started back in ... OMG, I never wrote it down! Thank goodness for blogging! I blogged about it on January 11, 2015. This is the second UFO that wasn't written down!!!! Another added to the UFO list of 2015. Oh well! 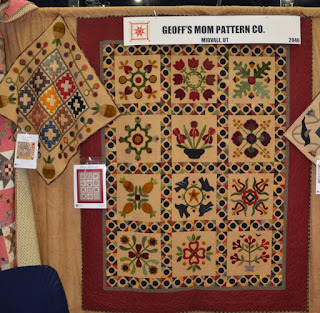 I saw the quilt at the 2014 Fall Internal Quilt Market in Houston, Texas. It was a wool BOM offered by Fibre Junction in January 2015. I do have all the sashing done except, don't ask me why, one block! I will always remember what Professors Ladd once said, "Carole, somethings just cannot be explained!" That's one of those "things". A nice break from machine applique! Your applique is really lovely. I am often amazed at the age of some of my UFOs. I will have to remember your professor's remark. I like that! Loved all the hand and machine applique blocks. Great to see that you used many red fabrics. Love scrappy!